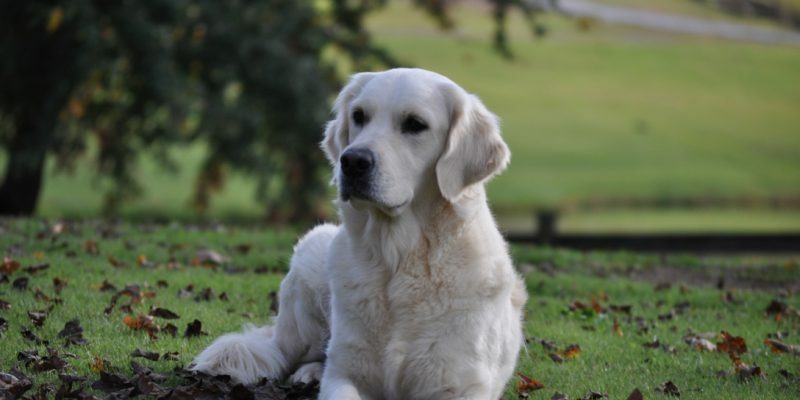 This page gives detailed pros and cons of the various types of collars for English Golden Retrievers (or really any breed). 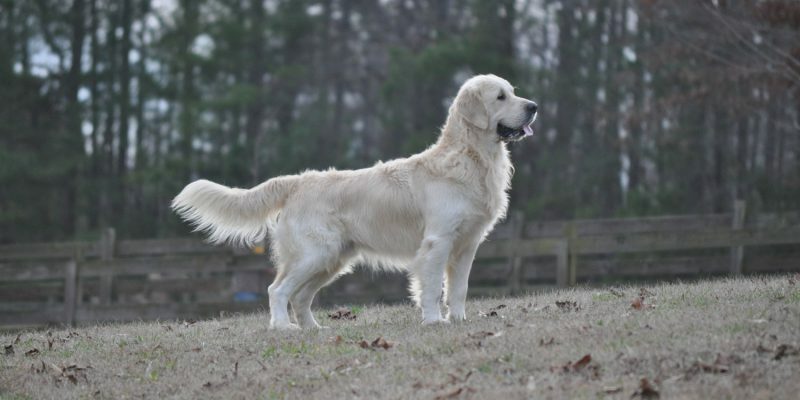 Some of the collars for English Golden Retrievers discussed below have been designed to give corrections. If you’ve not already read our page on Leash Pulling, read it to see how to use these collars work with regard to corrections. A collar made to give corrections should certainly not be left on when not needed. We NEVER recommend painful corrections, though we do use them to take the the reward out of leash pulling. Buckle collars are one of our two primary recommendations for puppies under 4 months. They are simple and safe. They give little to no correction and they don’t offer as much control as some of the other collars listed below. But, for most dogs buckle collars are a good choice. Martingale collars are our personal favorites for most situations. Martingales are designed to fit fairly loosely and are therefore comfortable to the dog. They tighten up when a dog pulls. This can be the basis for a small correction, but more importantly this feature keeps a dog from pulling out of a collar when on leash. It is a tremendous safety advantage over a traditional buckle collar. Unlike the old fashioned slip or choke collars, the martingale has a limit on how tight it will tighten. There is therefore no danger of the collar tightening too much with extreme pulling and possibly damaging a dog’s trachea. Head halter collars such as the Gentle Leader have been very popular with all-positive trainers in the past. However, several orthopedic experts have come out against them saying that they are causing misalignments and skeletal problems from the unnatural pull on the head. Though these collars look more humane to us humans than some of the neck collars available, they are actually less. Every dog that we’ve ever tried a Gentle Leader on has hated them. We never recommend any type head halter. Halter collars that fit around both the neck and the body have become very popular in recent years. Most of these collars have the leash attachment on the top. This collar is fine if your goal is simply to better control your dog. However, these collars actually encourage dogs to pull more because of the way the pulling sensation spreads beyond the neck to the body. They are worse than useless for training a dog not to pull. Still, a halter will give you better control than a traditional collar and control is better than nothing. Halter collars with a front clip do provide for training opportunities, but because of the type correction they gives, this type correction isn’t the best. These front hook halters are engineered so that when a puppy or dog pulls on the leash, the placement of the leash causes the dog to automatically turn toward the handler. A front clip halter is better (in our opinion) than attaching the leash to the top of the halter. What we don’t like about these halters is that they don’t deliver an ideal correction. The correction doesn’t cause the puppy to simply slow down. It pulls him into a position of being in front of the handler and turned around toward him. This position is almost as bad as being way ahead of the handler. It is not where I want my dogs to walk. Halters with front attachments can slow a dog down but before you can move forward, the dog must be realigned in the correct position. If you choose to use a front clip halter, position the leash on the outside of the dog (the side farthest from the handler). If the dog turns, he will be forced to turn to the outside away from you. This is still not ideal, but it is better than having a dog pulled to be in front of you. Halters are okay but if you’re going to give a correction, we recommend mild corrections with a traditional collar or better yet a Starmark or prong collar with small links. We discuss these collars later. A Starmark or prong collar will slow the dog down and at the same time bump him back into the position you want him to be in. Getting him back into CORRECT position is the goal and the faster you can do that, the faster you can go back to reward based training. Corrections are used to stop poor behavior but stopping bad behavior is not the ultimate goal. Replacing the poor behavior with good must be the reason for all training. For this to take place, the correction itself must lead the dog toward the good behavior. A top hook halter gives no communication at all toward correct behavior. If anything the reinforcement that comes from pulling on a leash attached to the top of a halter is actually communicating to the dog that pulling is what you are after. In fact, your pulling back on the harness is just adding to the game. The communications from a front hooked halter is better, but the communication coming from a leash hooked to the front of a harness is telling your dog that you want him in front of him. Either way, halters give poor communication to dogs when they are pulling forward. A handler needs to let a dog know that beside you is the place of reward and the quicker you can get him to your side, the quicker you can reward him. Starmark training collars are one of our favorite collars for walks with older puppies that like to pull AS LONG AS THE WALK IS IN A PLACE WHERE THE DOG FEELS SAFE. If you are taking your dog to a new place to desensitize him to new things, a buckle collar or martingale or maybe even a halter are good options. When taking a dog to a new place, your goal in training should be desensitizing him. This is not the time to be training him not to pull on a leash. Never use corrections if a dog is pulling because he is nervous. Prong collars have received a bad name because of those who don’t know how to use them properly and kindly and because they were originally designed with much larger prongs than are necessary. However, we feel that when properly used and fitted, a prong collar is as good as a Starmark collar. They look a little more intimidating to those who don’t understand their use but you can buy covers for them that make them look like regular buckle collars. Always buy prong collars in a size smaller than will fit your dog and then buy extra links (or buy 2 collars and move the links from the second to make the first the proper length). There is no need in having links as large as they are if you buy the collar that actually fits your dog in length. This is when a prong can be cruel. Smaller links give plenty of correction. For a Golden Retriever, buy a 12 inch prong collar with 1 inch links. Buy 2 of them or buy extra links because most adult Golden Retrievers need a collar that is 18-22 inches. If you use either a Starmark collar or a prong collar with small links and give small bumps with the leash. Prong collars with small links will give just the right amount of correction to take the reward out of pulling without actually hurting your dog. The prongs enable the collar to feel uncomfortable on the skin without causing pain to the neck itself and without pulling your dog out in front of you. Unlike the picture that is often painted by the uninformed, a prong collar in the hands of someone who knows how to use it can be a valuable and humane tool. None of my dogs fear or even mind a prong collar. In fact, they are excited to see either a Starmark or Prong collar because it means a walk will follow. I admit that the thought of a prong collar on me is painful, but dogs and people do not have the same type necks. Dogs have very tough necks with much tougher skin than people have and they are also covered with hair. I’ve never had a dog to squeel or cower or do anything else that would indicate pain with a prong collar. My gentle little pops are just reminders of Hey, I’m in charge. I control the speed. Don’t pull me along. A prong collar, used correctly is basically power steering for dog walking. You don’t jerk your steering wheel while driving. You shouldn’t jerk a dog around while walking. Both Starmark and prong collars have removable links so that you can properly adjust the length of the collar to your dog. Both collars should fit high on the neck and be tight enough so that they don’t slide down the neck. There is no need to use a prong on an English Golden Retriever under about 5 months. 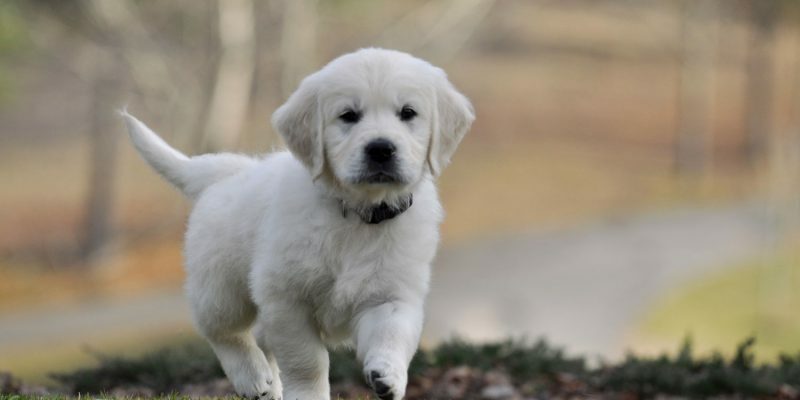 Other collars for English Golden Retrievers such as martingales or buckle collars are sufficient. Positive training needs to be the norm for younger puppies. However, as puppies get older, many could benefit from a prong. Remote collars (or shock collar) are another collar that many think is cruel. We disagree as long as a person is educated in their use and follows a few simple rules. Very few dogs (if any) dogs need more than a level 2 (out of 10 levels) reminder to come when quickly when called. If a dog responds with more than attention and obedience, or a dog yelps or jumps, too big of a correction has been used. This can make a dog timid. Always use the smallest correction to get the needed response. I only recommend a shock inducing training collar for those who’ve watched a good DVD explaining their use such as the one with Michael Ellis. Used incorrectly, a shock collar can cause more problems than it solves. A dog trained to an invisible fence is essentially trained with this same type collar which we do not recommend. Using a standard remote collar operated by a person is far better than trusting an invisible fence to administer the correction. Again, I recommend not training a puppy with any type shock collar until they are over 5-6 months including to an invisible fence. Slip or choke collars were designed years ago to administer corrections under the old Yank and Crank type training methods. We never recommend this type collar because they can damage a dog’s trachea. Before deciding on many of these collars, the very important decision must be made concerning what part corrections and control will play in your training. Never use a collar on a dog who is not on a leash. I have known of several dogs who have been killed by a collar getting caught on something. I’ve know several others who have had near death experiences because of collar issues. These were saved only because the owners were right there to rescue the dog. Many (maybe most) people have their dogs in a collar 100% of the time not realizing the dangers.